Billiards tables made to your specifications whatever the design! Hand made in the UK by experienced craftsmen to the highest standard with high quality materials. 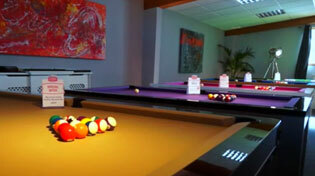 We work with a number of craftsmen who design and manufacture custom pool tables for us on a regular basis. From customising already existing models, to designing a completely new table from scratch, we can have almost any design you can imagine bespoke made to your specifications. Our large range of luxury pool tables are hugely customisable, enabling you to select from a wide variety of solid wood, metal, high gloss and painted finishes, along with different leg shapes and finishes and many cloth types and colours. If you have something more specific in mind, our bespoke pool table designers can work with you to create a unique model made to your specifications. Designer Billiards make many custom pool tables for our customers, with the knowledge of years of experience working with high end bespoke orders, from classic designs to some really outlandish briefs. They are skilled engineers and craftsman who design and manufacture the table here in the UK. Using sustainable and locally sourced materials where possible, these tables are made to the highest standard, with the lowest possible carbon footprint. Hurricane Billiards are American manufacturers and are experts when it comes to crazy pool table, shuffleboard and table tennis designs. With jaw dropping designs such as the Automaniac as their standard models, just imagine what they can come up with for custom designs when you let your imagination run wild. Their custome pool tables, bespoke shuffle boards and one of a kind table tennis tables are all designed to impress, providing the customer with an eye-popping centrepiece that will refuse to go unnoticed! The most recent bespoke pool table made by Designer Billiards is this solid oak table inspired by the Spartan, modified to have square legs with rounded corners and made to play American pool. The customer wanted a more rustic looking wood than is used on the standard Spartan model to go with the red brick and oak beams of the room it was destined for. He also requested a prominent wood grain texture, coupled with a natural looking oak stain with a much darker finish on the top rail and edging. The result is this beautiful unique pool dining table, complete with a three peice dining top. Hurricane Billiards e-mails us on a regular basis with photos from their workshop in Florida, showing off their current projects. They use a mixture of woodwork and metal work to produce these jaw-dropping designs for both their fully custom products and their standard models.